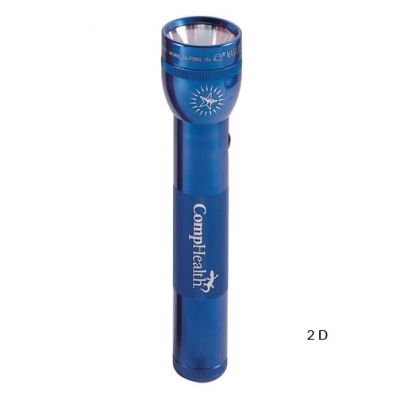 MagLite® 2D Flashlight with your Corporate Logo! The Mag-Lite is the best flashlight you have ever seen with only 2 D batteries. We laser engrave your logo on the handle or on the head. 10" length. Requires 2 "D" batteries, not included. The original Mag-Lite® flashlights. The number one choice among emergency, medical, fire, police and security professionals around the world. Mag-Lites® are dependable and durable enough to last a lifetime. • High-intensity adjustable light beam that goes from spot to flood by turning the head. They have a recessed push button to turn light on and off. Dual Xenon bulbs in the head. They are water & shock resistant and come with a spare Xenon bulb in the tail cap. • The perfect premium for any client. Great for safety programs, industrial promotions, high-tech premiums, automotive gifts with purchase and are also widely used by transportation and construction companies. Color: Black, Blue, Red and Gray.